1 waterslide decal sheet of national markings, codes and other aircraft-specific markings, and 1 x A4 fold out full-colour instruction sheet with marking options for five aircraft. A good overall package that marks a welcome return by Eduard to aftermarket decal production. This modest but interesting release is the first stand-alone decal sheet that Eduard has produced in a number of years. 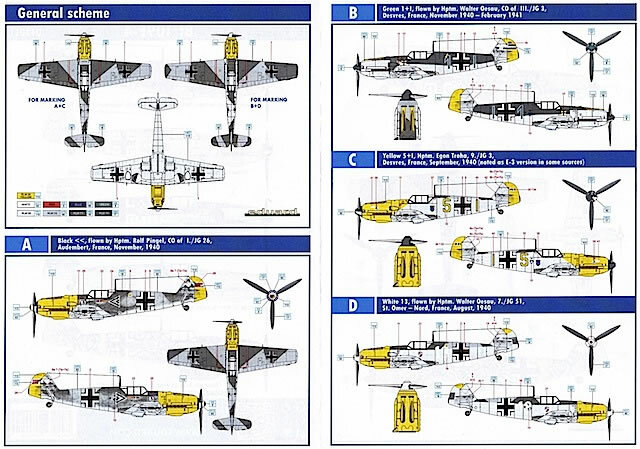 Intended to complement Eduard’s new 1/48 Bf 109 E-4 kit, the sheet provides markings for five Luftwaffe E-4s operating in France and Romania between mid-1940 and early 1941. All were painted in variations of the then-standard camouflage of RLM 02 Grey/RLM 71 Dark Green over RLM 65 Light Blue. I was able to find photographs of all of the aircraft except option B, and these suggest that Eduard’s decals and painting suggestions are accurate. Bf 109 E-4,‘Black double chevron’ flown by Hptm. Rolf Pingel, CO of I./JG 26, based at Audembert, France, November 1940. This aircraft had an RLM 04 Yellow nose and rudder, with what seems to be a heavy overspray of 02/71 on the RLM 65 fuselage sides. Not mentioned in the instructions, but faintly visible in a couple of photos, are what appear to be two painted over code letters (possibly ‘L’ and ‘V’) on the starboard fuselage between the chevrons and the Balkenkreuz. Bf 109 E-4, W.Nr.1559/‘Green 1+l’ flown by Hptm. Walter Oesau, CO of III./JG 3, based at Desvres, France, November 1940 – February 1941. This aircraft is shown as having a solid coat of RLM 70 Black Green along its upper fuselage from the cockpit to the vertical stabiliser. Presumably this was an attempt to tone down the original high-demarcation 65/02/71 camouflage, because the 02/71 finish is still present on the gun cover and engine cowlings. The RLM 04 rudder and gun troughs add colour to this otherwise subdued scheme. I could only find a picture of the vertical stabiliser of this aircraft, which shows Eduard’s representation of the victory markings to be accurate. Some sources suggest that W.Nr.1559 may have been flown by Oesau’s predecessor as Gruppenkommandeur of III./JG 3, Wilhelm Balthasar, rather than Oesau himself, so further research is recommended if you are modeling this option. Bf 109 E-4, W.Nr.5153/‘yellow 5+ l’ flown by Hptm. Egon Troha, 9./JG 3, based at Desvres, France, September 1940. Troha crash-landed this aircraft in Kent on 29 October 1940 after combat with RAF fighters. An interesting feature that is not mentioned in the instruction profiles is the almost feathered demarcation between the upper surface camouflage and the RLM 65 fuselage sides. ‘White 13’, flown by Hptm. Walter Oesau, 7./JG 51, based at St. Omer-Nord, France in August 1940. Definitely Oesau’s aircraft on this occasion, ‘White 13’ had a slightly lower camouflage demarcation than ‘yellow 5+ l’. Eduard’s finely reproduced kill markings for the stabiliser and rudder are a highlight of this option. ‘Black <l 5’ of II./JG 54, based at Arad, Romania, January 1941. This colourful and well-photographed aircraft has been well captured by Eduard, particularly in the instructions’ representation of its complex fuselage camouflage. While it is clear that Eduard has put considerable research into this release, this effort is let down slightly by the quality of the instruction sheet. The full-colour profiles, plans and scrap views are all well done, and match closely with photos of the real aircraft. However, in my view the illustrations are too small, having been crammed on to a single, double-sided A4 page. They would have been better spread out over two pages, even if this slightly raised the cost of the package. The decals have been produced by Eduard, and look excellent on the sheet. 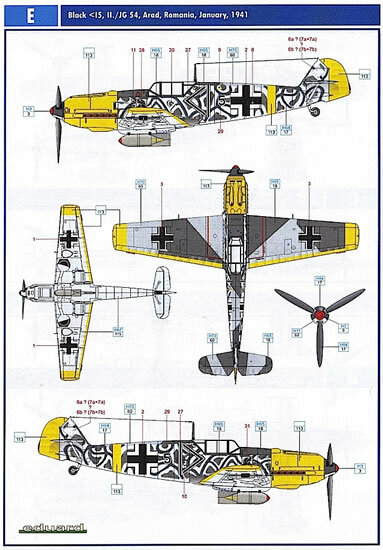 Colour density appears good and registration is perfect, down to the tiny kill markings sported by options A-D. Swastikas are provided as single- or multi-part decals, to accommodate different laws in relation to this symbol. No stencils are provided; Eduard has just released these as a separate standalone decal set. 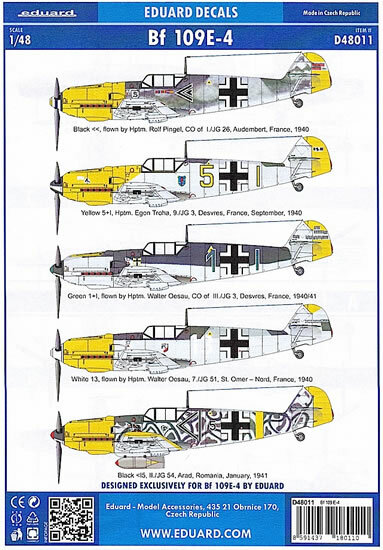 In a crowded 1/48 Bf 109 E decal market, Eduard has done well to find five so varied Emils for inclusion in this release. I’m not sure what other decal sets Eduard is currently developing, but hopefully these will include instructions that match the high quality of the decals and their underlying research. In the meantime, it’s good to have Eduard decals back!